Construction Chemicals « Global Market Insights, Inc.
Construction sector is surging at a rapid pace across BRICS nations, making vital contributions towards Construction Chemicals Market revenue. Thriving APAC construction industry will positively influence the business with China displaying strong growth trends. High preference for weather resistant and earthquake resistant buildings will provide construction chemicals industry players with new opportunities for exploring untapped markets. Asia Pacific construction chemicals industry is expected to record a CAGR of 9% over the period from 2016 to 2024, having collected a revenue of USD 14 billion in 2015. China construction sector, estimated at USD 1.7 trillion in 2015, is expected to boost the regional growth. India and Japan are the few of the other countries of APAC, which are expected to make significant contributions towards the regional revenue, having attained a collective revenue of over USD 1 billion in 2015. Europe construction chemicals market, estimated at USD 4.5 billion in 2015, is expected to grow at an annual rate of 8% during the next seven years. Large-scale use of protective coatings in residential & commercial constructions to build fire resistance will add to the revenue. Mounting need for renovating heritage buildings will boost the demand for sealants and adhesives. Concrete admixtures, sealants, protective coatings, adhesives, and asphalt modifiers are the key products of construction chemicals industry. Concrete admixtures, which made major contributions to the overall revenue in 2015, is expected to occupy a significant chunk of construction chemicals market share in future. Its ability to enhance cement quality and high resistance property have made it more popular in commercial and residential projects. 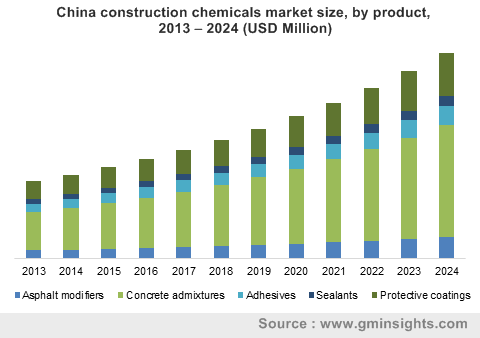 Adhesives and sealants worth USD 2.5 billion and USD 1.5 billion in 2015, are predicted to make notable contributions towards the construction chemicals industry revenue over the coming seven years. The presence of multinational corporations has made construction chemicals industry extremely consolidated, with top four market players accounting for nearly 50% of the overall revenue. The business space is highly competitive with market participants depending on technological innovations, strategic alliances, and joint ventures to raise their production and retain their market positions. Arkema, Pidlite Industries Limited, Ashland Incorporation, BASF SE, Evonik Industries, The DOW Chemical Company, Sika AG, Huntsman Corporation, The Tremco Group, Mapei, W. R. Grace & Company, RPM International Incorporation, Henkel AG & Company KGaA, Fosroc, The 3M Company, AkzoNobel Chemicals, Knopp GmbH, and Albemarle Corporation are the major participants of construction chemicals industry. This entry was posted in Bulk & Specialty Chemicals and tagged Chemical Industry, Construction Chemicals, Construction Chemicals Market, Construction Chemicals Market Analysis, Construction Chemicals Market Forecast, Construction Chemicals Market Outlook, Construction Chemicals Market PDF, Construction Chemicals Market Report, Construction Chemicals Market Share, Construction Chemicals Market Size, Construction Chemicals Market Trends, Construction specialty chemicals market., Electronic specialty chemicals market, Food additives specialty chemicals market, Multi Construction Chemicals. The global population, which is estimated to grow rapidly touching a 9 billion mark by 2040 is a major factor driving the specialty chemical industry. Possibly, all the industries of the world are witnessing a supply/demand imbalance due to this population growth, the food industry being in the topmost concerned space. The food security concerns can be realized looking at the population vs arable land growth rate during 2015. Where on one hand, the population witnessed a 5% increase, on the other side the arable land witnessed a growth of 3.5%, which clearly indicates the agricultural food scarcity the world may witness. This imbalance is making the farmers adopt Agrochemicals on a large scale, thus boosting specialty chemicals industry size. Automotive industry is one of the top potential growth prospect for specialty chemicals market. Automotive industry utilizes a broad range of specialty chemical products in the form of paints & coatings, polymers & plastic additives, adhesives & sealants, lubricants, etc., thus contributing towards a significant share of specialty chemicals industry. The expanding automotive industry coupled with the growing demand for fuel-efficient vehicles will bring a huge set of opportunities for the market space. The chemical industry has rightly been marked as a key parameter to achieve sustainable development for other industries. Chemicals are the key differentiators of any two products under comparisons, and are thus being widely and of course wisely adopted by the manufacturers worldwide. Paints & Coatings industry is a well-suited example of explaining this feature, where 80% of the raw materials in almost all the paints are same, and the rest 20% which are the differentiating factors comprises the specialty chemicals. 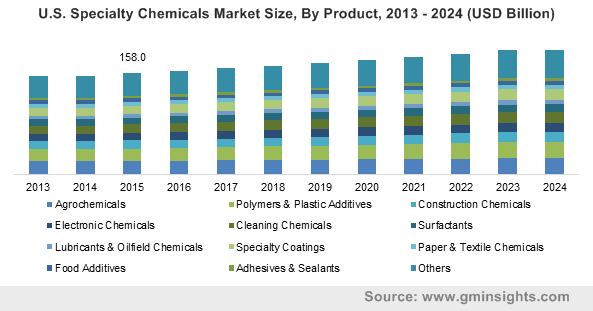 Construction specialty chemicals market, which had a revenue of USD 70 billion in 2015, is estimated to have a noticeable surge over the coming years owing to the rising number of commercial and residential projects worldwide. However, the high costs associated with the raw materials to manufacture these products will be a prime matter of concern for the manufacturers worldwide. SMBs will be the major sector impacted by these high priced raw materials. Asia Pacific has significantly emerged as an efficient and cost-friendly raw material supply source for the international companies, enabling these manufacturers to tap this emerging market. Moreover, the growing automotive and construction industry is also a vital factor favoring APAC specialty chemicals market size. Asia Pacific specialty chemicals market is expected to grow at a CAGR of 6.5% over the period of 2016-2024. North America is estimated to account for the second largest market followed by Europe. In the coming years, the companies worldwide will spend heavily on R&D activities to walk parallelly with the growing consumer needs and demands. The industry, which is highly competitive and fragmented presently, will witness various collaborations and partnerships for efficient manufacturing of these products. Key market players are Dow Chemical, INEOS Group, BASF, Bayer, Ashland Inc., DuPont, Clariant, Huntsman, Syngenta, Evonik Industries, Arkema, Albemarle, Akzo Nobel, Eastman Chemical Company, Chemtura, and Solvay. This entry was posted in Bulk & Specialty Chemicals and tagged Application Potential, Cleaning Chemicals, Competitive Market Share & Forecast, Construction Chemicals, Electronic Chemicals, Lubricants & Oilfield Chemicals, Price Trends, Specialty Chemicals Market Size By Product, Specialty Coatings, Surfactants.